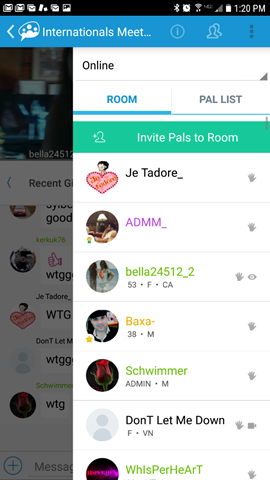 When you are in a chat room tap on the ‘people’ icon near the top right of the screen. You will see a list of the room’s participants. Tap again to close the list. From here you can view your pal list, or tap on anyone in the room to bring up a menu of options. You can also invite others to the room or change your online status.